We Want You! To be a part of ICDS! Are you a fan of anime, cosplay and pop-culture? Do you have a burning passion for all things geek? Do you want to be a part of the team that puts Singapore on the map as a choice cosplay destination for pop-culture lovers, not just in Asia, but around the world? 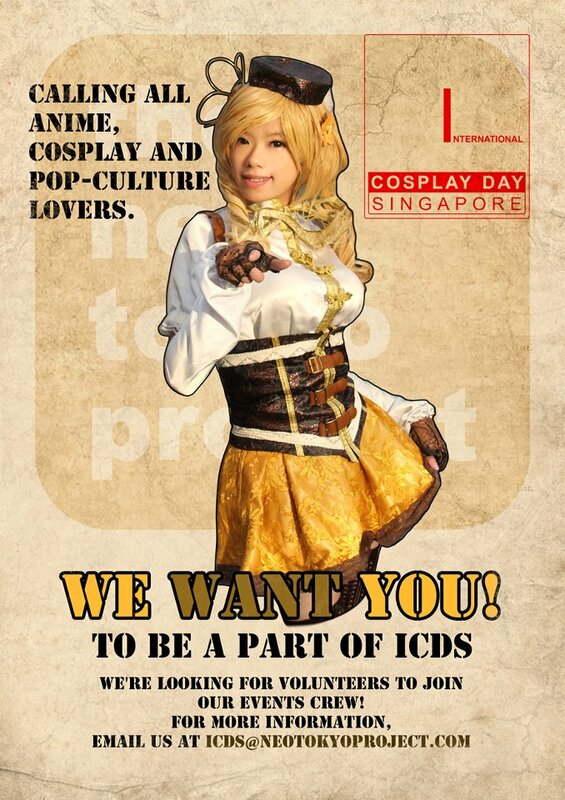 If you think you’re a good fit, then we want you to be a volunteer at this year’s International Cosplay Day Singapore. The Neo Tokyo Project is recruiting 15 bold and stalwart individuals to be part of our ticketing, event logistics and security team, so if you think you’ve got what it takes to crew this monster of an event, please do drop us a line. We sure as heck can’t pay you (ICDS is a not-for-profit event), but we can give you free event passes, backstage access, a chance to mingle with our international cosplay stars, and exclusive volunteer-only goodies. Also, if you’re a student, we’d love to issue certificates of participation and talk to your schools about the possibility of awarding you CIP points for your trouble. If you’re interested, do write us at icds@neotokyoproject.com with your Name, NRIC, Address, Contact Number and Email address, and we’ll get back to you as soon as we can!